We are well into our week of celebrating Earth Day here at Small Potatoes…and it’s time for something messy! Anyone who knows me will tell you how much fun I have with a colourful mess. 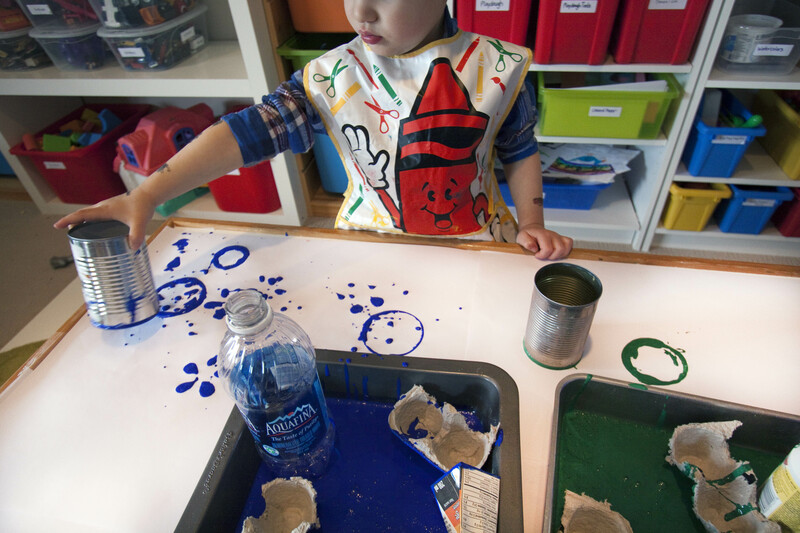 The bigger the mess, the more fun. Plain and simple. 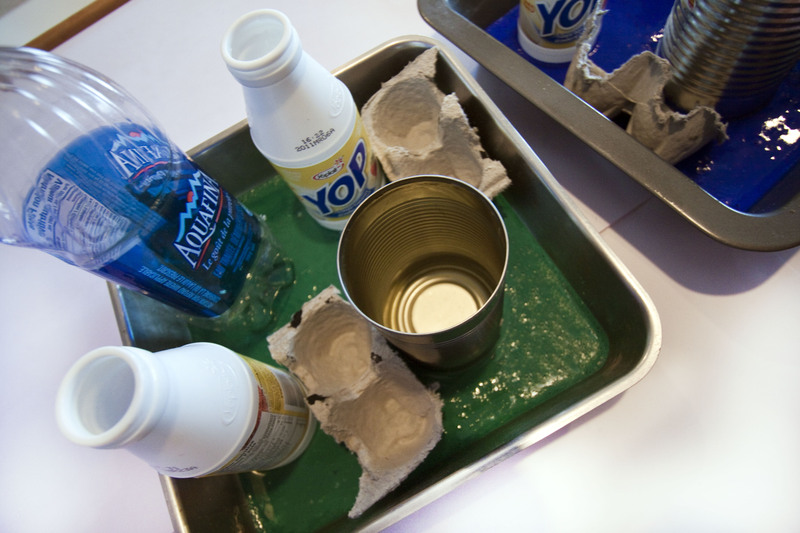 So…we made a couple of cake pans filled with paint. Green and blue for the colours of the earth. Then we hauled our recycling bin down to the art centre. 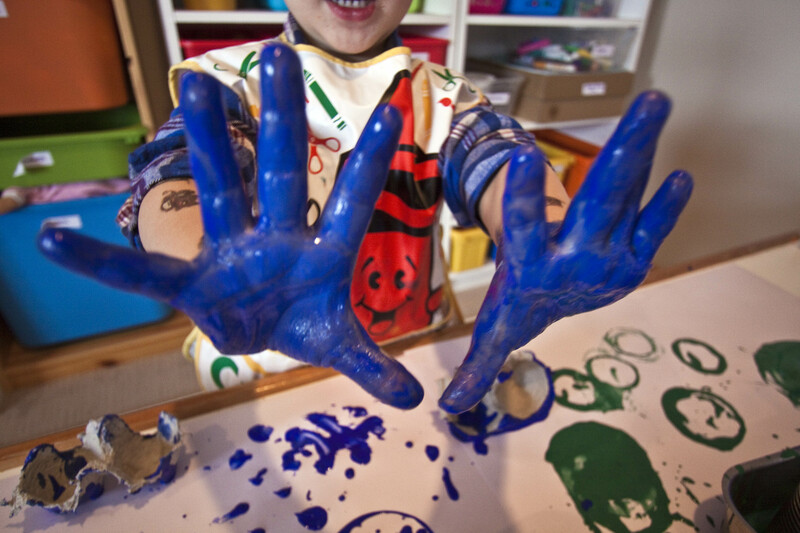 I make my paint with clear dishwashing soap, a splash of water, and powdered tempera. The soap keeps the paint thick, and gives it a nice sheen. Plus, its waaaaay easier to clean up! The kids and I went through the recycling to see what might make a good painting device, as we were not using brushes today. 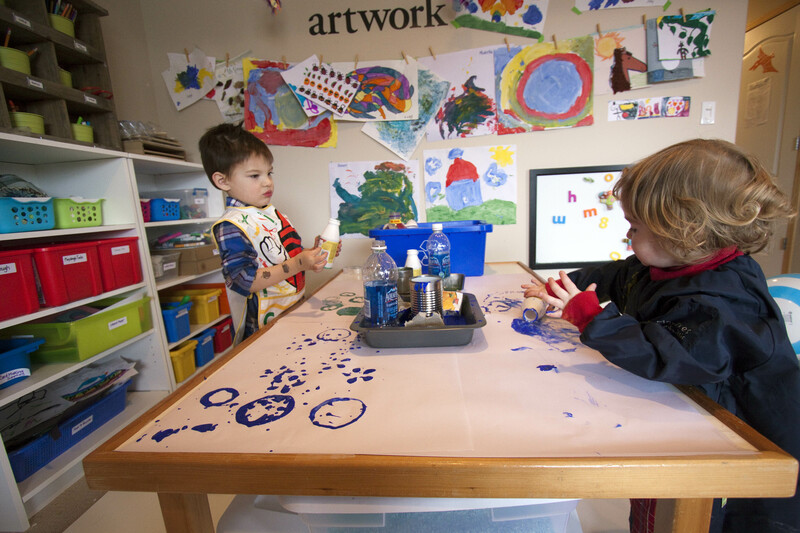 Then they settled into the process of creative art. And oh, what a joy it was to watch. They started out carefully and tentatively. 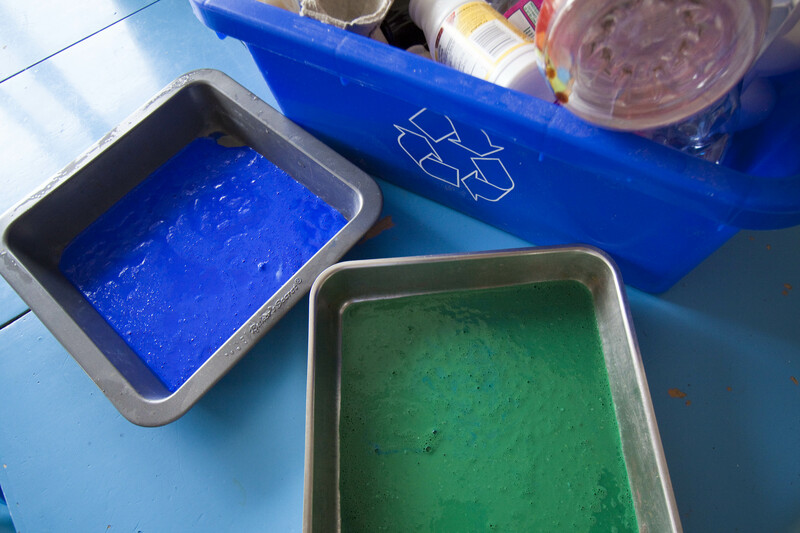 Experimenting with each recycled item to see what kind of print it made. The toddlers especially loved banging the soup cans on the table. Oh, and I forgot to mention, I taped paper to the table so the paper wouldn’t lift during the printing process. There is nothing more frustrating to a toddler than a paper that won’t stay put! Once the experimenting was out of the way, the real fun began. 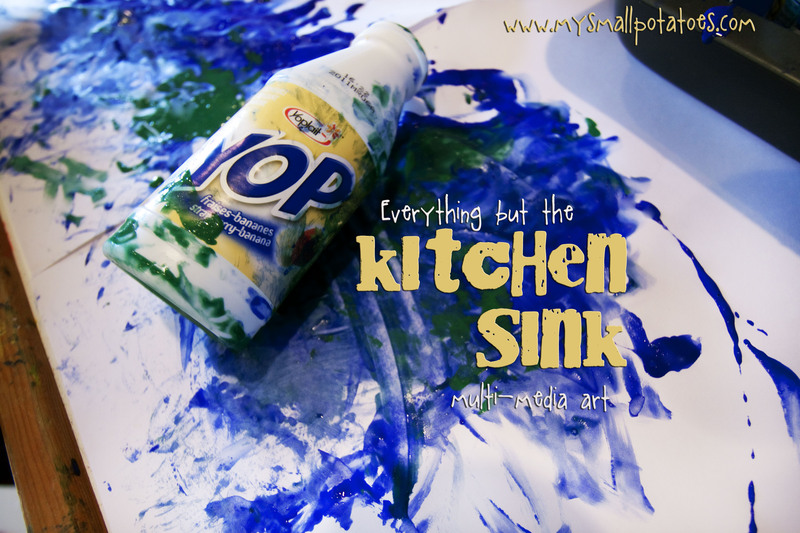 The toddlers tried filling the yop bottles with paint and poured them out. 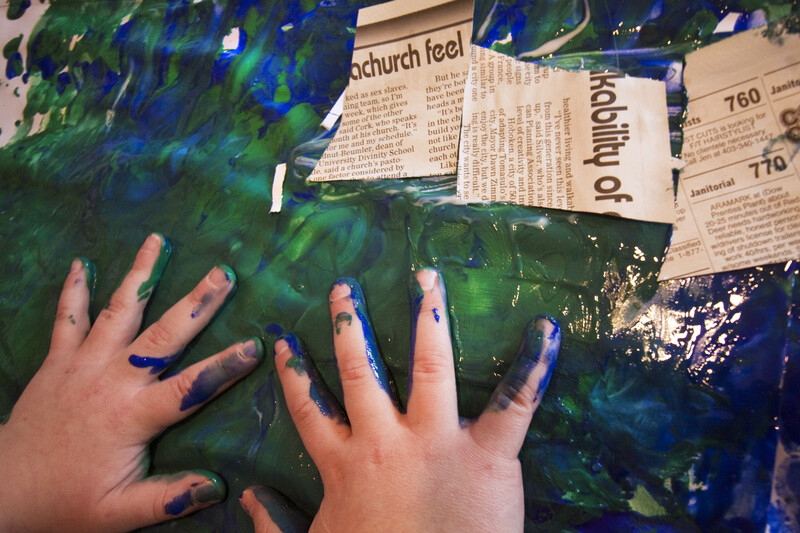 And then they abandoned the recycling entirely and did what I expect of all the wee ones at my house when the paint comes out…they used their hands! When bigger kids came home from school, they got in on the action. 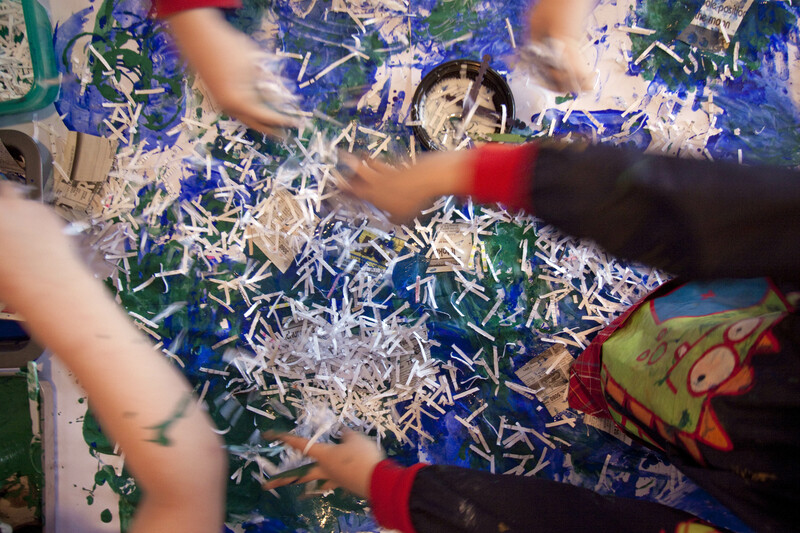 This is when I brought out a bowl of glue, shredded paper, and newspapers from the recycle bin. I gave them popsicle sticks to spread the glue, but they decided hands work better! Today is a big day for me! It’s my very first time working with the Kids Co-op. What that means to you, is that you have from today until next thursday to add a link to one of your blog posts to show us one of YOUR favourite kid-friendly activities! Just click on the link button below and follow the easy steps. Then, grab the Co-Op button from below and put it on your blog to link it back here. And when your finished linking, maybe you’d like to browse through the other links to see more fabulous ideas! I keep a basin of water close by at all times! lol! Thank you sooo much! KBN has been so gracious and helpful!! Looks great…well done! I haven’t even got around to my Co-Op post yet!!! 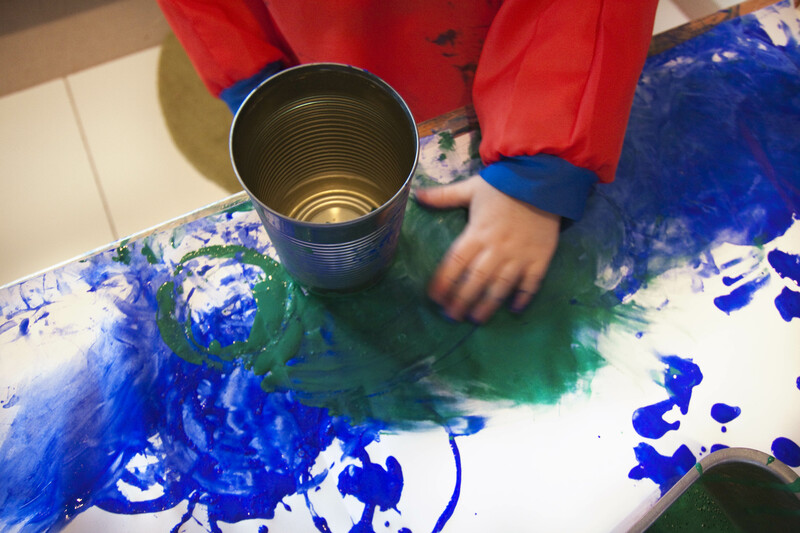 love all that paint, mess and creativity!